Do you believe his statement? A video has gone viral of a student in a MAGA hat facing off with a Native American elder, and now this student is speaking out. There’s two sides to every story. Does this new context change your opinion? 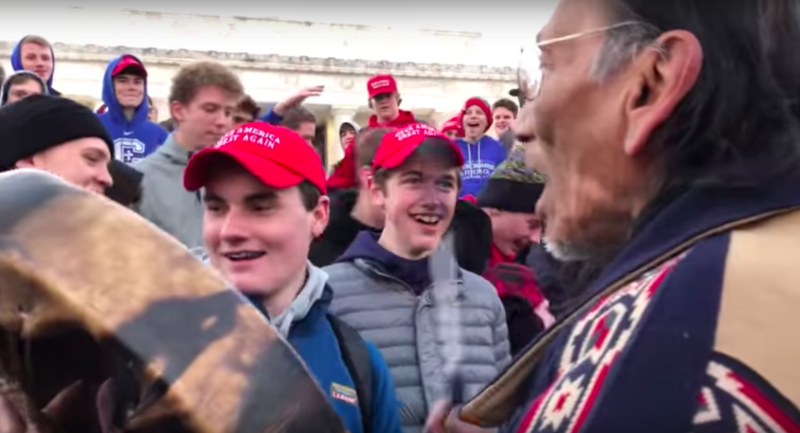 A video has gone viral of a student in a MAGA hat harassing a Native American elder…and now this student is speaking out. In the days leading up to Martin Luther King Day, which celebrates civil rights activist Martin Luther King Jr, who dedicated his life to the pursuit of racial equality, tensions rose between students and a Native American elder as this moment recorded on the same steps where MLK gave his famous I have a dream speech went viral. Social media exploded, calling out the students for exhibiting racism and disrespect for the Native American elder. Celebrities like Alyssa Milano “The red MAGA hat is the new white hood. Without white boys being able to empathize with other people, humanity will continue to destroy itself. Zerlina Maxwell said “I can’t get the maga kid’s face out of my head bc it’s so familiar. That smug look is my childhood and I’m not the only one. White journos spending today doing detailed tick tocs might want to interview a Black or Brown person about why it resonated. That’s part of the story.”, and people even went far enough to find the student’s high school and change its name on google to Covington Catholic White Male Entitlement High School. But now a new video along with the student’s own statement is providing more context to the situation. in a statement, the student in question, Nick Sandmann, explained that he and his classmates were visiting Washington DC to participate in the March for Life, which opposes abortion laws. After the march, the students were instructed to meet at the Lincoln Memorial where two other groups, the Hebrew Israelites and Indigenous Peoples Rally were also gathered. In this video, the Hebrew Israelites can be heard using disparaging and vulgar language aimed at the students and racist slurs aimed at the Indigenous Peoples. In a Facebook video, one of the participants in the Hebrew Israelites group said: “I know we seem aggressive reading the Bible, but the Bible states for us to cry aloud and don’t spare anybody’s feelings. We’re not violent or ignorant.” In response to the students’ chanting, Native American Elder Nathan Phillips, decided to approach the group. Phillips had intended to create a prayer circle singing what he said was a well-known spiritual song associated with the American Indian Movement of the 1960s and used for prayer and resistance. “We chose to go over there…to sing a song to hopefully change something.” Some witnesses claimed that the students were shouting “build that wall”, though these chants are not audible in any available videos at this time. As Phillips approached the group, he locked eyes with Sandmann for an extended period of time. 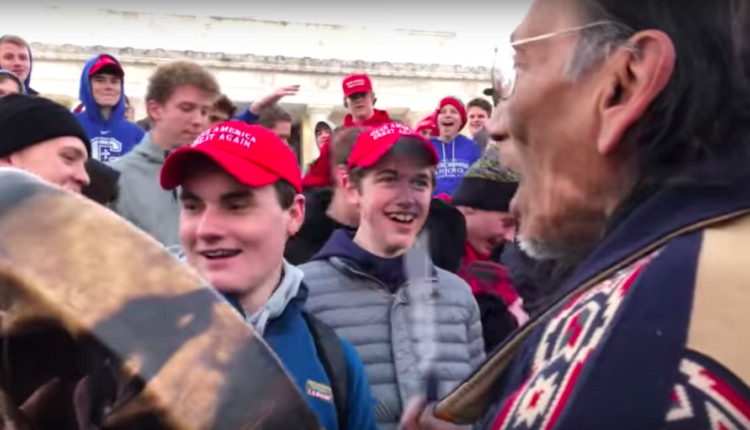 This interaction is what has largely been interpreted as blatant mocking, while Sandmann claims he was smiling to diffuse the tense situation. This causes a lot of uproar online, and videos of Phillips’ response began circulating. Phillips is an Omaha-based Vietnam veteran who holds an annual ceremony honoring Native American veterans at the Arlington National Cemetery. So there are a lot of perspectives about what happened in this viral moment. But what do you think about these varying perspectives? Let us know in the comments or on Twitter at @WhatsTrending.